Queens, N.Y. – Last night Aggressive Combat Championships continue to impress fans with another highly entertaining and well balanced fight card. ACC 12 was center stage at the Queens Theater at Flushing Meadow Park, in New York. The fight card included one title defense, and three bouts for a vacant belt. Jillian Decoursey successfully defended her ACC strawweight crown after making quick work of her opponent Anastasia Bruce in the first round of the main event. Destiny Quinones took home another title in a K1 bout at atomweight (105). Geo Alverez finished Richard Pabon with two seconds remaining in the second round via submission. 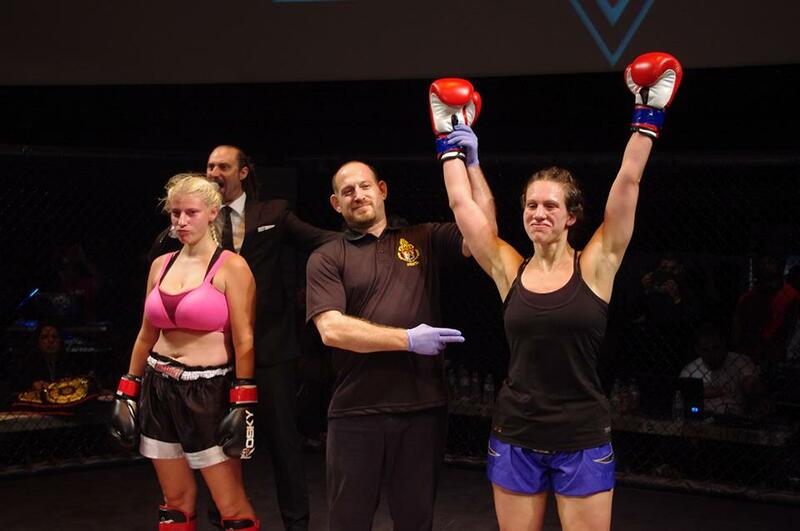 Paige Di Bartolo-Lian won via a unanimous decision over Brye Anne Russillo in a highly media anticipated title fight. In the main event of the evening, Decoursey of ECUBJJ improved her record to 3-1 with another successful title defense over Anastasia Bruce. Decoursey proved why she is the 115-pound ACC MMA champion. Once the signal was given to fight, Decoursey resembled a shark with the smell of blood in her nose. The champion delivered a series of strikes to Bruce, before she eventually dragged her to the canvas and climbed into full-mount. While in full-mount, the ECUBJJ fighter dropped walloped on Bruce until the referee interjected calling the fight in the first round at 1:04. Quinones’ displayed accurate strikes as she went three rounds with a tough opponent in Rebecca Carnage. Quinones fights out of Kai Next Level MMA and continues to show growth every time she enters the cage. “The Caged Cutie” K1 ACC title fight victory over the Valhalla Muay Thai fighter Rebecca “Rampage” Carnage, gave Quinones her third belt between various divisions. Quinones earned a unanimous decision by the judge’s score of 30-27 on all three score cards. Geo Alverez of Apprentice MMA battled Richard Pabon of Empire MMA for nearly two full rounds before Alverez finished the bout via submission. Alverez easily won the first round after controlling Pabon most of the round. In the second round roles flipped as Pabon was controlling the majority of the and had they reached the bell, Pabon would have evened the score on the judge’s score cards, but Alverez eliminated any chance of that happening when he locked up a tight Guillotine choke that finished Pabon with only two seconds remaining in the round. Alverez defeated Pabon via submission, by way of Guillotine Choke in the second round at 2:58. In the fight that captured global media attention after a week of wild headlines, Paige Di Bartolo-Lian of American Top Team went three rounds with the internet star Brye Anne Russillo of Valhalla Muay Thai. The two females battered each other as they exchanged kicks, body strikes, and combinations to the head. Lian applied majority of the pressure throughout the three rounds leading to her unanimous decision victory for the 150-pound catch-weight ACC K1 title. The official decision was a unanimous decision scored 30-27 on two judge’s cards and 29-28 on the thirds. Fight of the Night awards went to Mike Maldanado of American Top Team and Christian Wassweiler of Evolution MMA for their amazing back-and-fourth brawl. The first round went to Wassweiler as he reversed an early takedown by Maldanado. Once on top, he controlled Maldanado from the top position landing a great amount of ground and pound. In the second round, Wassweiler earned a quick takedown and was quickly caught in a leg triangle, where he spent much of the second round being abused by Maldanado. Wassweiler absorbed a great deal of punishment and showed great heart and toughness as he fought through to the third round. In the third round it was clear Wassweiler was still hurting from the second round. After taking a body kick, Wassweiler earned a takedown. Maldanado reversed the Evolution MMA fighter gaining top position. Maldanado delivered heavy ground and pound throughout the third round and eventually earned a TKO in the final second of the bout at 2:59. Once again Aggressive Combat Championship’s Co-Owners Tom Kilkenny and Eugene Perez delivered a spectacular event in a great venue. Matchmaker Eugene Perez built a great fight card that was filled with action from top to bottom. The night ended with five unanimous decisions, four TKO’s, two submissions, and a split decision. That kind of balance proves the knowledge Perez has when creating match-ups and does an excellent job finding fighters opponents at the same level. ACC 13 will take place December 5th, 2015, at the Queens Theater in Flushing Meadow Park, New York, New York. 155- K1- Joe Par (White Tiger Martial Arts) def. Frank Medeiros (East Coast MMA) via Split Decision, 29-28, 29-28, 28-29. 155- K1- Andrew Artemeou (East Coast MMA) def. Kenneth Rayside (Kai Next Level MMA) via Knockout in Round 1 at :54. 185- MMA- Brendan Shaw (American Top Team) def. Marcus Chen (Apprentice MMA) via Unanimous Decision, 30-27, 30-27, 30-27. 145- MMA- Steve Sierra (ChutBoxerUSA/Joker MMA) def. Dennis Stamp (Striking 101) via TKO in Round 3. 205- MMA- Damilola Powerson (Striking 101) def. Kelvin Francisco (Holy War Angel MMA) via Unanimous Decision, 30-27, 30-27, 30-27. 150- K1- Title- Paige Di Bartolo-Lian (American Top Team) def. Brye Anne “Bone Breaker” Russillo (Valhalla Muay Thai) via Unanimous Decision, 30-27, 30-27, 29-28. 125- MMA- Title- Geo Alverez (Apprentice MMA) def. Richard Pabon (Empire MMA) via Submission by way of Guillotine Choke, in Round 2 at 2:58. 105- K1- Title- Destiny “The Caged Cutie” Quinones def. Rebecca “Rampage” Carnage (Valhalla Muay Thai) via Unanimous Decision, 30-27, 30-27, 30-27. 115- MMA- Title- Jillian Decoursey (C) (ECUBJJ) def. Anastasia Bruce via TKO in Round 1 at 1:04.